Storied encounters between soldiers and the Devil are, alas, eternally and universally relevant. However, they acquire special intensity during particular eras. One of those eras in Russia comprised the several centuries over which stretched the Russo-Turkish wars, among the longest recurring conflicts in human history: the iterations went from 1568 to the Caucasus Campaign of World War I, concluded in 1918. Most famous of these engagements to Westerners is, perhaps, the Crimean War (1853-1856), during the reign of Czar Nicholas I, in which Russia lost Crimea to the allied forces of France, Britain, the Ottoman Empire (then in decline), and Sardinia and in which both sides committed egregious blunders in military logistics. (This is the war for which some of the British deaths were immortalized by Alfred, Lord Tennyson in his poem "The Charge of the Light Brigade.") The losses from both sides, during the Crimean War alone, amounted to nearly half a million men. As you might expect, on the Russian side, the officers and commanders were drawn from the aristocracy and higher social classes, while the fighting fodder was heavily represented by peasants, Jews, and other groups who couldn't buy their way out of serving. If you were impressed into the Russian army at this period, your term of obligatory service was 25 years. I learned this in the early 1970s from one elderly Russian émigré, who, sometime around the turn of the 20th century, had gone A.W.O.L. after being impressed and walked across Continental Europe until he was able to make his way to England, where he made a fine life for himself and lived into very old age in St. John's Wood. During the time of this gentleman's grandfather—the 1850s and '60s—the folklorist Alexander Afanasyiev ("The Russian Grimm": 1826-1871) published what ended up as an eight-volume treasury of Russian fairytales and fables. These landmark volumes, which have provided generations of artists with inspiration for literature, ballet, and opera, include many tales about a generic peasant soldier or soldiers (often named "Ivan") who has been impressed into the army and who meets up with the Devil. In one of these tales, the soldier actually wins over his greedy opponent by getting the latter drunk on vodka and then convincing him that a bushel of bullets is caviar. The Devil eagerly devours them, explodes, and is never seen again. Igor Stravinsky liked this one especially, as he apparently indicated to the French-speaking Swiss novelist C.F. Ramuz, Stravinsky's intimate and his recent artistic collaborator on Les Noces, the composer's monumental dance cantata for Diaghilev, and some smaller works. The two were casting about toward the end of World War I for a subject from which to develop a simple production of musical theater that could be toured by a band of travelling players around Switzerland, where the collaborators were then living impecuniously, in exile, and they alighted on Afanasyiev's soldier-Devil stories. Ramuz, the script writer, preferred a bittersweet one, "The Runaway Soldier and the Devil," about an infantryman who, though he has exacted much from Mephisto, can't stop craving one thing more and is tricked by the Devil into crossing a border, into becoming an exile, to get it. In doing so, the soldier loses everything he has, including his wife and his soul, which is embodied by his little fiddle, whose music had given him comfort and heart. In developing L'Histoire du soldat, with the subtitle "pour être lu, joué, et dansé" ("The Soldier's Tale: to be read, acted, and danced"), Ramuz and Stravinsky focused on that sadder story, and so a work that could have been a comedy or burlesque ends with a fatal sting. As it turned out, it is the sting that makes L'Histoire memorable and reminds audiences nearly a century later that, as L'Histoire was being conceived, just over the Swiss border millions were dying, often hideously, in The Great War. Ramuz's script, a sophisticate's version of a Medieval morality play, calls for four performers. Three have speaking lines: a narrator, the Soldier (named Joseph here), and the Devil; one—the Princess, whom the Soldier revives to life, marries, and loses—is a silent dance role. Stravinsky's forces comprise a small band of violin, double bass, clarinet, bassoon, trumpet, trombone, and percussion. His score is a Modernist kaleidoscope of changing meters and an unsettling congery of musical genres, including a miniature playlist of dance tunes (paso doble, tango, waltz). And its sound, at least in its upbeat sections, is often compared to jazz, even though Stravinsky protested that, when the music was written, he hadn't yet heard American jazz, though he had studied some jazz on the page and did admit to having heard American dance-hall numbers. A vivid anthology of musical textures, the score also contains adagios of considerable pathos mixed with satire. (One of the chorals, for instance, has been identified by the scholar Helen Wong—author of the excellent study "Swiss made by Stravinsky—Musical Supranationalism in L'Histoire du soldat (1918)"—as "a modified version of Bach's chorale Ein' Feste Burg.") The sense the ending implicitly gives of the soldier's emotional annihilation as he is overwhelmed by the Devil's infernally percussive victory dance—which can also be thought of as the soldier's heart-pounding comprehension of his eternal exile from human happiness—is a state the composer himself shared. Late in life, Stravinsky told Robert Craft: "The greatest single crisis in my life as a composer was the loss of Russia, and its language not only of music but of words." The wordless concert suite of five numbers from L'Histoire that Stravinsky arranged, in 1919, for clarinet, violin, and piano (and that has frequently been performed on its own, as well as occasionally choreographed) is, perhaps, the musical essence of the crisis to which the composer referred. Even so, in any performance, the great theatrical achievement is the tone, the lack of kvetching or sentimentality and the freely released musical smirks and outright laughter: the lasting triumph of L'Histoire is its distancing humor, which makes it possible for the audience to go on. Not all listeners have considered the score a triumph. The brilliant composer-conductor Constant Lambert famously despised it, for example, calling its "melodic fragments. . .completely meaningless themselves" and the cadenza for solo drums "musical purity. . .achieved by a species of musical castration." In opposition, though, the Stravinsky scholar Eric Walter White observed that, although only three musical numbers are used in Part I, where they are repeated, in Part II, after the restatement of the Soldier's March, there are no further repeats. The music, proceeding from the Little Choral to the Devil's Triumphal March, "takes over and imposes its own values and pace on the work as a whole, thereby raising it to a higher power than the mere sum of its parts." 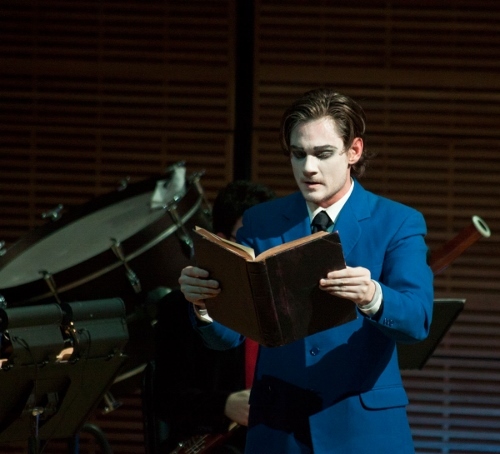 Performance history is extensive for L'Histoire productions—both the full, 50' version with Ramuz's text and the concert suite—and excerpts. In the Wikipedia entry alone, this history is both global and surprising, ranging from conventional theatrical stagings and recordings in English, German, and French; to a production for the Montreal Symphony Orchestra's 2008 tour of Nunavik (the Inuit homeland in Quebec), which featured a translation of the script into Inuktitut by Inuit writer Zebedee Nungak; to Peter Martins' memorable yet rarely programmed 1981 ballet to the suite, for a skyful of classical dance stars at the New York City Ballet; to covers of the Soldier's March on two albums by Frank Zappa. Among the individuals who have played the various characters on stage or in recordings are Jean Cocteau, John Gielgud, and Ian McKellan (The Narrator); the singer Sting and Jean-Pierre Aumont (The Soldier); Robert Helpmann, Marcel Marceau, and Vanessa Redgrave (The Devil); and Svetlana Beriosova and Mercedes Ellington (Princess). My favorite among the Wikipedia listings is the 1984 hand-drawn animated film, conceived by and credited to R.O. Blechman and actually animated by the unheralded Tissa David, a point brought forward in a MoMA program by the animation scholar John Canemaker. In this version, the Devil's voice is provided by Max von Sydow. L'Histoire's 1918 world première, in Lausanne, was conducted by the marvelous ballet conductor Ernst Ansermet; its director was the well-regarded, Russian-born Georges Pitoëff, and its choreographer was his wife, Ludmilla. 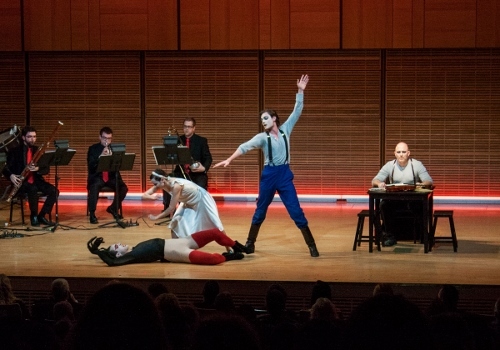 Dr. Wong acknowledges another scholar, John Willet, for the insight that elements of this original staging (putting the orchestra along with the actors and dancer in full view of the audience; mixing mime, dance, and speech; and using a "two-way, go-between" narrator) were borrowed from the experimental Russian theater of Vsevolod Meyerhold, one of Georges's close collaborators. I haven't been able to find what the actors and dancer did (or even who they were), but it is known what they wore. Stravinsky biographer Stephen Walsh has written: "[At]the première the Soldier was dressed in the uniform of a Swiss army private of 1918, while the costume of the lepidopterist (one of the Devil's four disguises) was that of the 1830s; the Princess wore red stockings and a white tutu, the narrator a tailcoat. . . ." Unfortunately, the Spanish influenza effectively retired the production from touring almost immediately, although, Stravinsky was able to get the concert suite played. To these historic renditions of L'Histoire du soldat, it is my pleasure to add a brand-new one: The Soldier's Tale, a collaboration of alumni/ae, current students, and faculty of the Yale University Schools of Music and Drama in conjunction with Yale in New York. Presented out of the air for one night only at Zankel Hall (and, it seems, just once at Yale), it's the most thrilling live performance I've attended so far in 2014. The stage director is Yale Rep's resident director and the chair of directing at the School of Drama, Liz Diamond, a fluent French speaker, who also renovated Ramuz's script for English speakers with a new, suave translation. The music director and clarinetist is David Shifrin, a professor in the practice of clarinet and chamber music at the School of Music and a veteran of many other L'Histoire productions. The choreographer—and this is a dance-driven staging—is Yale College and master's program alumna Emily Coates, who directs the dance studies curriculum at Yale and who, as a dancer, is an alumna of the New York City Ballet, The White Oak Project, Twyla Tharp Dance, and projects with Yvonne Rainer. The narrator, here called "The Reader" (as he gives the impression he's reading the story in a book) is Yale College alumnus Michael Cerveris, familiar to New York theatergoers for his masterful Broadway performances in the works of Stephen Sondheim, to start with, and for his roles as a singer with the late New York City Opera, the New York Philharmonic, and productions and concerts in such venues as Carnegie Hall. The scenic designer is Michael Yeargan, co-chair of the design department at the School of Drama and a luminary of Broadway, London's West End, and opera companies internationally. The designer of the breathtaking costumes is School of Drama faculty member and alumna Ilona Somogyi, whose credits include Broadway and Off-Broadway, regional theater, and the Ringling Bros. and Barnum & Bailey Circus. The violinist who matches gestures with and provides the soul's voice for The Soldier is School of Music professor Ani Kavafian, well-known for her chamber music performances across the U.S. (The Soldier may be a lowly grunt as a character but his soul needs to be insured big-time: Ms Kavafian plays the 1736 Muir McKenzie Strad.) And The Soldier (lanky and flexible leading-man charmer Tom Pecinka), The Devil (physical comedy virtuoso and transformer artist James Cusati-Moyer), and the Princess (petite exemplar of Lillian Gish-like silent-screen acting Mariko Parker), all M.F.A. candidates at the School of Drama, are already formidable actors, with professional credits that light up a playbill and a command of diction and timing that would have quieted a Vaudeville house. A couple of critics in the audience scoured the theater after the show for the program booklets, expecting that, in light of the blazing talents who put it together, that ephemera from today will be sought by archives tomorrow. What made it so stirring? First, the show did what Stravinsky's writings suggest that he wanted. The music was played as if the band was voicing itself as a seven-headed creature, on the qui vive to communicate with the actors yet also independent of them. The musical forces paid strict attention to tempi and intonation, down to the occasional "squeaks" put in by the composer in memory of the itinerant fairground bands of his childhood. On the visual front, the understated, "simple" designs worked as part of a richly layered stage world: set (a table and chair for The Reader, chairs for the musicians, and a thin, neon or neon-like strip running from wing to wing, changing colors to indicate changing locations), lighting (day, night, moonlight, spotlight), and costumes, most particularly those for The Devil, whose transformations kept us guessing about how the color red would be redeployed in his outfits (as red-hot gloves, as the legacy red stockings of the 1918 Princess, as a hellfire-red Jersey Boys suit). 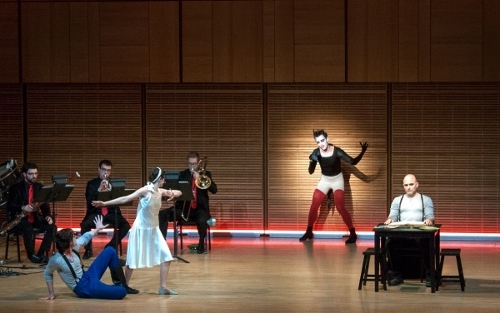 The four actors, though only dancers secondarily, are fluent movers—Mariko Parker's Princess appears to have had classical training and James Cusati-Moyer's Devil appears to have had some kind of background in a percussive dance tradition—and they can all physically act the dancing and/or gestures precisely. 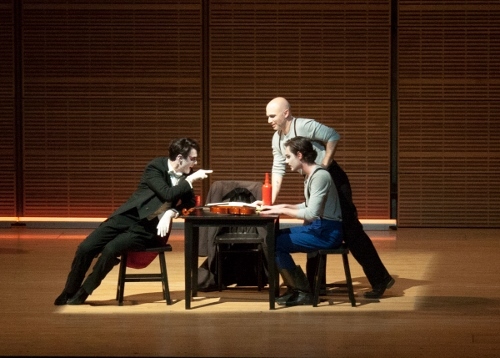 The platinum standard here was Cerveris's Reader, who, seated for almost the entire running time, continually adjusted his posture and focus, so that sometimes he projected himself as potentially a giant were he to stand up and sometimes he shrank his spine backwards while enthusiastically pitching his shoulders and head forward until he practically resembled Stravinsky. (All the while, he was plunging his voice in and out of different characters, the transitions among them as undetectable as the gear-shiftings of a Lexus.) 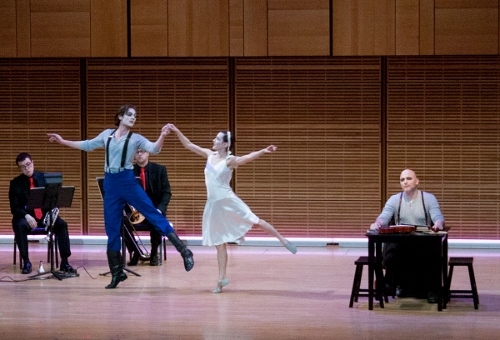 Choreographer Coates ingeniously provided each of the standing characters with his or her own movement language, too, wedding this "dance-speech" to the band's rhythms and ringing changes on the phrasal elements for a theme-and-variations effect. The Soldier ambles, struts, marches, and prances through strictly metered variations on a walk. The Princess gives the impression that she initiates her warm-blooded, mostly terrestrial, balletic movements with her arms and torso, the parts of the body most viscerally associated with emotional expression. The Devil, in shoes with spool heels (an analogy for the cloven hooves of old), takes rapid, goatish, mincing steps that alternate with down-boy! second-position pliés. The speed and incidence of each element get recalibrated according to which guise he's adopting (his old procuress uses the wide second position to indicate arthritic legs, while his fey lepidopterist keeps legs magnetized together). When the Devil finally breaks into his dance of triumph—hair gelled into a mullet, black-gloved hand gripping a mic, red-suited body careering between the gyrations of a lounge lizard and the automatism of a Hip-Hopster—he unfurls himself as Machiavelli of a Thousand Steps, fastidiously matching them to the drum's relentless patter. In my experience, rarely does an event one knows to be tragic stimulate such feverish glee in the theater. Or in life. And yet, occasionally, even in life, the condemned beats the Devil. A case in point is my maternal grandmother's youngest brother, Max. A veteran of the American Army in The Great War, he met his Devil, in the form of a skin-melting gas, on a battlefield in France. When Max left for war from his native Newark, New Jersey, my mom told me, he was as small but as funny and energetic as Mickey Rooney. Everyone in the family adored Max for his optimism and unfailing sense of humor. The Max I met as a five-year-old was still small and adorable, though wizened, and still a man of twinkling sweetness. And he wore his Devil's memory, unreconstructed by plastic surgery, like a second skin: in that trench in France, Max had survived, though he had given up half his face. But he had retained his "fiddle," which, in his case, was his compassion and humor, and he served, in every way, as the life of the party. This review of The Soldier's Tale is my salute to him.